Comflors, Inc is a family owned and operated business specializing in indoor sports flooring. Brian C. Snoke, as owner, estimator, and project manager, has been in the flooring industry since childhood when he worked with his father doing installations. His working knowledge as an installer has greatly enhanced his understanding of the complete process from job site conditions to completion which ensures the success of each project. Comflors, Inc. has been incorporated for 16 years and functioning as a company for 20 years. As a company we strive to work with architects, building contractors, and private entities, to build and maintain long lasting relationships and become a first choice subcontractor. We anticipate continued success as we keep up with new and innovative trends within the industry. It is important to us to provide installers who are skilled, clean cut, respectful, and well trained in their trade. We provide continuing education and are always encouraging the growth of our installers. 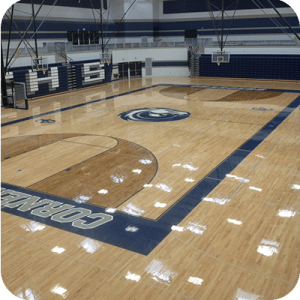 For every basketball court, dance floor, multi-purpose room, running track etc we provide, we complete the entire process from start to finish. This includes painting game lines per MFMA standards, logos and lettering. Because we are a small business, we pride ourselves on our ability to give every account personal and prompt attention. With every new customer we try to achieve a one-on-one relationship to ensure that the customer’s needs are met and every project is successful.